Introduction: After the success of the first submarine cables in the early 1850s, the laying of short cables became routine, but longer cables presented more problems. It was, of course, of considerable financial and political interest to span the Atlantic Ocean, and the attempts in 1857, 1858, and 1865, and the eventual success in 1866, attracted much attention. This section of the Atlantic Cable website provides a convenient central directory of the large amount of material on these cables. On Submerging Telegraphic Cables - report on a paper read at the Institution of Civil Engineers on 16 February 1858, by Mr. J.A. Longridge, M. Inst. C.E., and Mr. C.H. Brooks. On the Practical Operations connected with the Paying-Out and Repairing of Submarine Telegraph Cables - paper presented on 23 February 1858 to the Institution of Civil Engineers by Frederick C. Webb. The 1858 cable station in Newfoundland and the landing of the cable. Includes previously unpublished paintings made at the time. 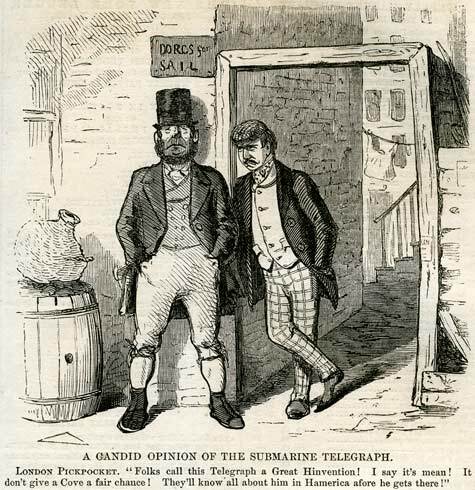 My Connection with the Atlantic Telegraph by James Burn Russell. Transcription of sections of the manuscript journal of Williiam Thomson's assistant, who accompanied Thomson on the 1858 cable expeditions. An important source document, previously unpublished. Leaves from the Journal of an Amateur Telegrapher by James Burn Russell. Published articles based on the experiences described in the journal above. 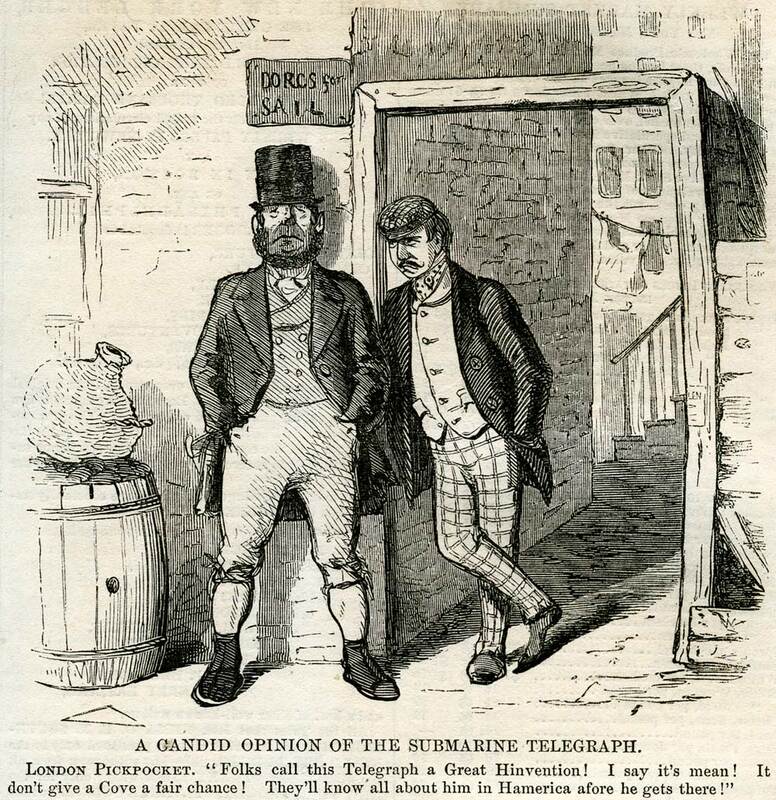 London Pickpocket: "Folks call this Telegraph a Great Hinvention! I say it’s mean! It don't give a Cove a fair chance! They'll know all about him in Hamerica afore he gets there!" William Russell & Robert Dudley’s book: The Atlantic Telegraph - includes scans of the cover, title page, tinted lithographs, and original artwork from the book recording the events of the 1865 Great Eastern cable expedition. Edward Bright: Description of the Manufacture, Laying and Working of the Cables of 1865 and 1866; with an Explanation of the Means Employed for Recovering the Lost Cable of 1865. Bern Dibner’s book The Atlantic Cable, published in 1958, provides an excellent overview of the 1857 -1866 Atlantic cables, and is available on line at the Smithsonian Institution’s website. A 2016 article by Nigel Linge and Bill Burns, "The Cable that Wired the World," gives an illustrated overview of the Atlantic Cable project on the 150th anniversary of its successful completion. Salient Features In Cable Design Since 1850 - a timeline of cable technical developments from 1850 to 1959 by Submarine Cables Ltd.